In this Muscat travel guide, I’m going to share with you practical information about where to stay, things to do, and we’ll especially focus on the delicious food to eat when you visit Muscat, Oman. Muscat is an incredible, spacious, clean, and friendly city, with so many things to offer you when you visit. Ok, let’s get right into this Muscat travel guide for food lovers! If you fly into Muscat, you’ll land at Muscat International Airport, which is a small and kind of sleepy airport located right within the city. I flew into Muscat on Air India from Mumbai, on my round the world trip ticket with Star Alliance. The easiest option for getting from Muscat International Airport to the center of Muscat (0r wherever you hotel is), is by taking a private taxi. Right outside the arrivals terminals, there are white taxis with a big blue stripe on the side. They are the official airport taxis and unfortunately they are extremely expensive, but they are one of the best ways to get into the city. 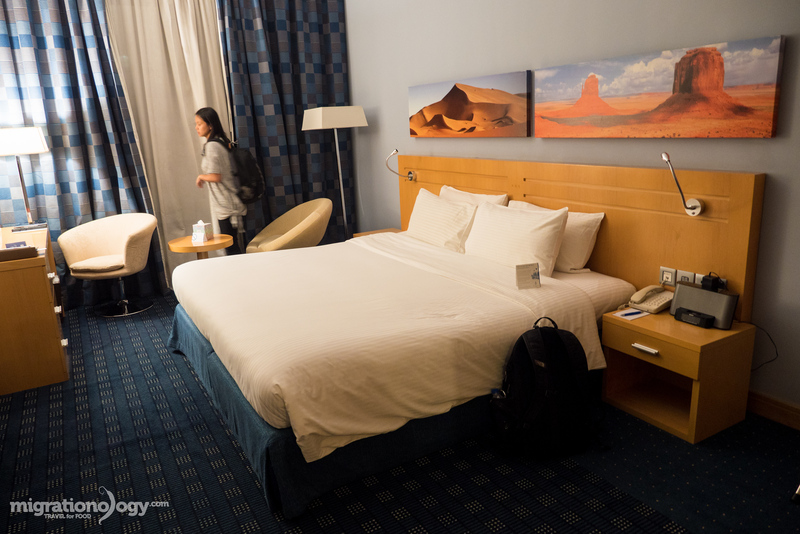 From the airport to City Seasons Hotel where I was stayed, which was only a few kilometers away, it cost 9 OMR ($23.37). There are a couple of different options when it comes to getting a tourist visa, but for the most part, many nationalities can get a visa on arrival at Muscat International Airport by paying a fee (do check your country individual requirements though). Here’s the official Oman tourist visa info, and there’s also some good clear information provided about eligible countries and visa options from Oman Air. I stayed in Oman for just 3 days, so when I landed in Muscat, I went straight to immigration and bought a 10 Day single entry visa for 5 OMR ($12.99). The line was short and easy, and the immigration staff were friendly. I happened to exchange a little bit of Omani Rial’s before flying in, so I paid exact money for my visa, however they do accept foreign currencies (best if you have USD or EUR probably) or credit card. Where To Stay In Muscat? Muscat is a very modern city, and when you visit, you have a choice of some of the modern international hotel chains as well as more local Middle Eastern hotel chains. Muscat Center – Not far from the airport, Muscat city center is a good area to base yourself, and although it’s a spread out city, there are cafes, restaurants, and attractions in the center, plus Qurum Beach. You’ll find hotels like City Seasons Hotel (where my wife and I stayed) or Ibis Muscat. 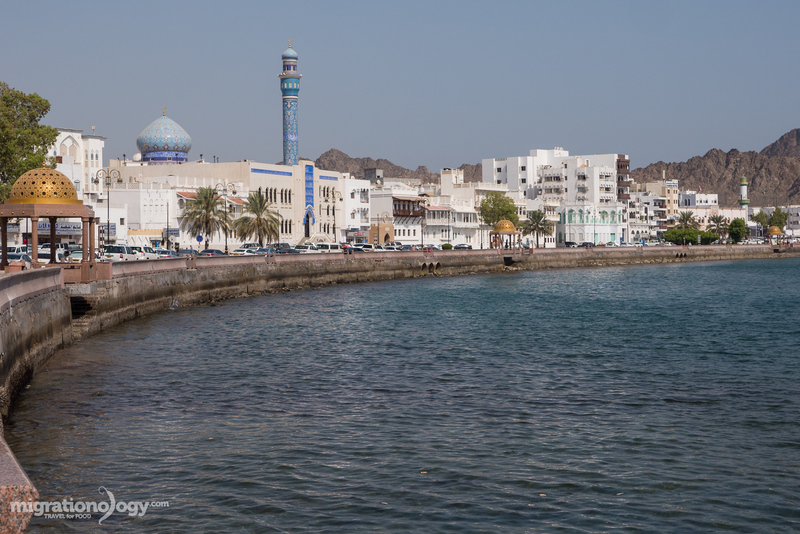 Ruwi and Muttrah – Another good area to search for hotels in Muscat is a little further east in the areas of Ruwi and Muttrah, which are some of the main tourist areas of Muscat. Muttrah is the political and administrative area of Muscat, and there are many things to do and see in that area. You’ll find hotels like Al Falaj Hotel and Mutrah Hotel. Beach Resorts – One of the draws of Muscat are the beautiful beaches located right near the city, and there are some high end resorts like the Al Bustan Palace Ritz-Carlton or Shangri-La Barr Al Jissah Resort on private beach just outside Muscat. When choosing your accommodation in Muscat, it depends on what type of transportation arrangements you have and what type of experience you want to have when you’re in Muscat. *City Seasons Hotel Muscat – My wife and I stayed at City Seasons right in the center of modern Muscat when we visited. The hotel was pretty good, nothing too fancy, but very adequate and in a good location right next to the main highway. I paid about $85 per night. Before visiting Oman, I really had no idea what Omani food was – it’s a cuisine that can be rather difficult to find (unless you know an Omani friend) outside of Oman. But that makes Omani food truly exciting to taste and discover. Trade – The Omani Sultanate was historically a very important empire in the Middle East stretching from the Strait of Hormuz to parts of India, and also to Zanzibar (awesome food in Zanzibar by the way), off the coast of Tanzania. Trade and fusion has been a part of the culture of Oman for centuries, and Omani food has been directly influenced by this. You’ll find spices from India and East Africa throughout Omani cuisine. There are even some Omani dishes that use coconut milk. Sea – When I think about Middle Eastern food, meat is typically what I think of, but in Oman, with its long coastline and fertile seas, fish and many types of seafood are a huge part of the local diet. Dried fish in particular, due to the abundance of fish and the abundance of sunshine in Oman, is a common ingredient. Middle Eastern Gulf Culture – And then finally, making use of the ingredients from Oman. One of the most distinguishable components to the local cuisine are Omani dried limes, which are present in many different dishes and really provide a source of amazing flavor (Omani dried lemons are considered the best int he world by the way). Another common ingredients in Omani food is ghee, animal oil. Saveur magazine calls “Omani food too good to ignore,” and I have to agree with them. It’s an exquisite blend of flavors, paired with unique Omani and Gulf culture and style. Here’s another good article from NPR about Omani food. That’s just a very brief introduction to Omani food and how it has developed and been influenced. Now let’s go over a few of the foods to eat and drink when you’re in Oman. 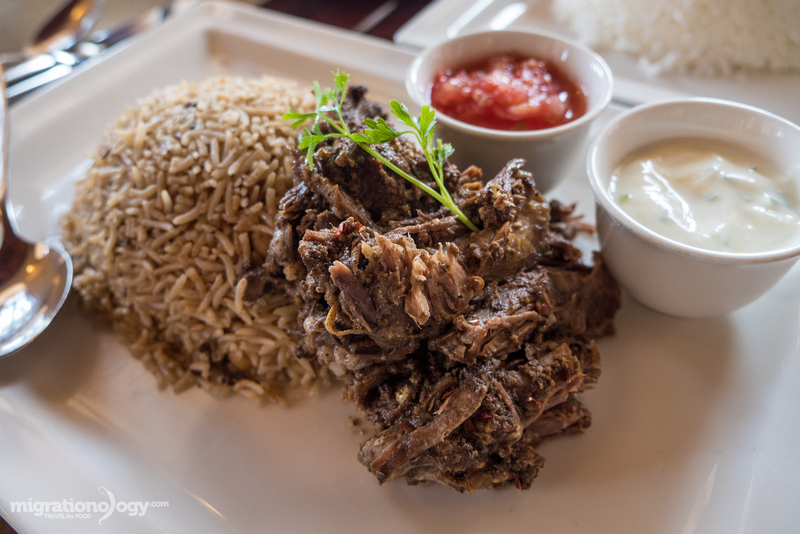 Shuwa – Considered one of the national Omani foods, shuwa is a dish of lamb or goat slow cooked in an underground oven with spices. After a long process of slow cooking, the meat is typically served on a big tray over a bed of rice and eaten communally. Omani shuwa is especially common to eat during family festivities and celebrations. There are many similar dishes to shuwa throughout the Middle East like Bedouin zarb. Harees – This was a totally new dish to me when I tried it in Muscat. It’s a porridge made from wheat and ghee, mixed in with some type of meat (often chicken), and served with a sweet date or raisin sauce to go with it. It’s a fantastic dish. Makbous – Very similar to kabsa, a popular Arab food originally from Yemen, makbous is a dish of rice, meat, and vegetables, all seasoned with spices, and often served on a communal tray to eat together. It’s delicious and hearty and provides a huge meal. I liked eating makbous with yoghurt, tomato chutney, and salad on the side. Thareed – An interesting Omani dish I tried is thareed, a dish of bread cooked with sauce to become a very thick sticky porridge like consistency and mixed with fish. It was extremely heavy, but quite good. Camel curry – I’m not sure what it’s called in Oman or in Arabic, but when I was in Muscat, my fried Mustafa took me to a restaurant where we had both camel curry and fried camel with rice, and it was the best meal I had in Oman. Camel tastes similar to beef, but a little more meaty tasting, and it’s incredibly delicious. I especially enjoyed the camel hump pieces, which literally melt in your mouth. 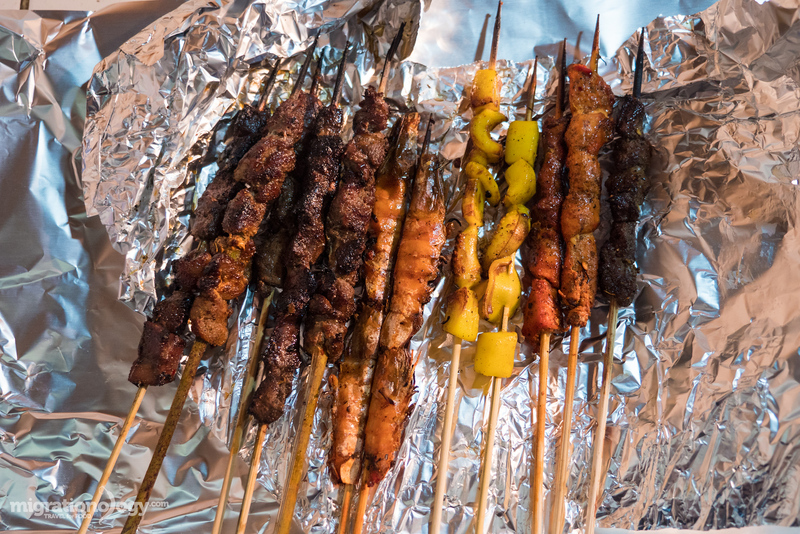 Mishkak – There’s not very much Omani street food, but the main street food that you’ll find is mishkak, skewers of marinated grilled meat and seafood. The meat can be marinated in a garlic, ginger, and spices, and then grilled over flaming hot charcoal. Mishkak is eaten with spicy chili sauce or tamarind sauce. Mishkak is one of my favorite Omani foods to eat, especially in the evening. Along on the east coat of Africa, you’ll find amazing mishkak, known as mishkaki. Halwa – According to my friend Mustafa, halwa is one of the only authentic Omani desserts. Halwa is a very sweet Omani dessert made from starch and sugar cooked into a thick sticky paste and seasoned with rosewater, saffron, and nuts. You’ll enjoy it if you love sweets, but it was a bit too sweet for me. Dates – Dates, as in most of the Middle East are a huge part of the food and culture in Oman, and you’ll have a non-stop selection of dates to try when you travel to Oman. I liked trying fresh Omani dates right off the palms. Coffee and Tea – Another significant part of Omani culture is tea and coffee, and while I won’t get into too many details in this Muscat travel guide about the cultural aspects, I will say that both tea and coffee are extremely important. Omani coffee is typically not strong at all, but quite weak and watery, with scents of rosewater and saffron. Coffee is a common social drink and since it’s weak you can drink many cups in a row, and also drink it while eating some dates for sweetness. Tea on the other hand is usually very strong, sweet, and creamy, with cardamom or ginger. 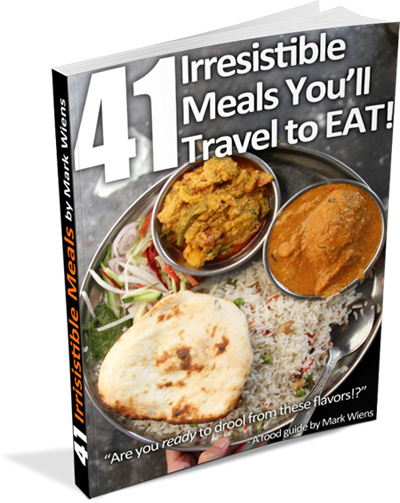 Again, in this Muscat travel guide I’ve just given a brief introduction to Omani food. This is just a start and a few of the most memorable things I ate when I visited. There’s still so much more Omani food and culture to discover when you visit. In Muscat you’ll find restaurants serving a variety of different food including local Omani restaurants, Yemeni, Indian, Turkish, and Western food. Here are a few of the restaurants I tried in Muscat, and also a few restaurants that were recommended to me (that I didn’t have a chance to personally try myself, but they look good). Bait Al Luban Restaurant – This is one of the most well known modern trendy restaurants in Muscat, but for a good reason. They serve both traditional Omani food, plus modern interpretations of Omani dishes using Omani ingredients. Although it’s expensive, it’s a really nicely designed restaurant, located in Muttrah, and occupying an old inn. The shuwa was excellent, and I also enjoyed trying harees for the first time. Finally, another reason to eat at Bait Al Luban Restaurant is to sit in the beautiful ambiance and drink Omani coffee after your meal. On a side note, although I thought it would be a touristy restaurant, there were actually more locals eating here than tourists when I ate here. Bin Ateeq -With multiple locations in Muscat, Bin Ateeq is a traditional Omani food restaurant, where you can sit on the floor and eat communally in the Omani style. You’ll find many of the main Omani dishes on their menu. Camel Restaurant (مطعم مظابي صلالة Mathabi Salalah) – My friend Mustafa brought me to this restaurant, and they specialize in camel curry and fried camel. It was hands down one of the best Omani meals and experience I had in Muscat. Thanks for Mustafa! 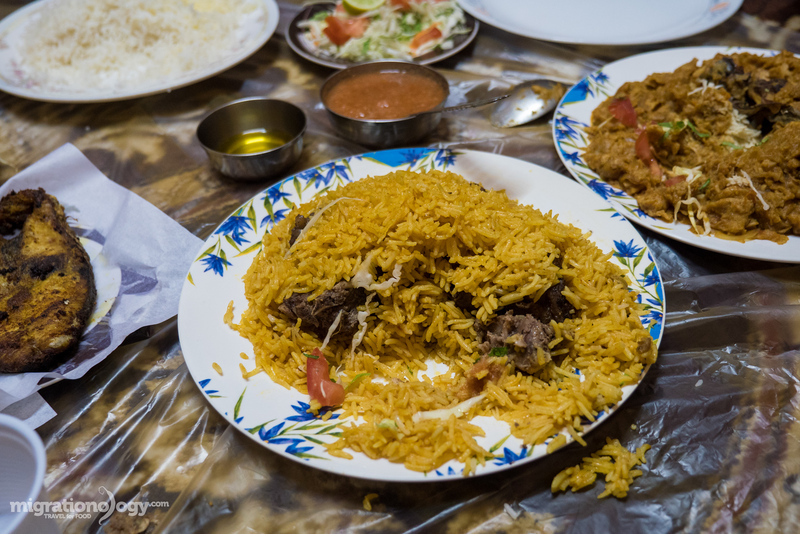 Omani Street Food Mishkak in Al Seeb – Al Seeb is a bit of a drive from the center of Muscat, but it’s worth heading there for some Omani street food mishkak in the evening. Along the beach there are a few permanent street food stalls that sell delicious grilled meat, and you can either eat in the AC of your car, or stand around the parking lot while devouring some smoky skewers. 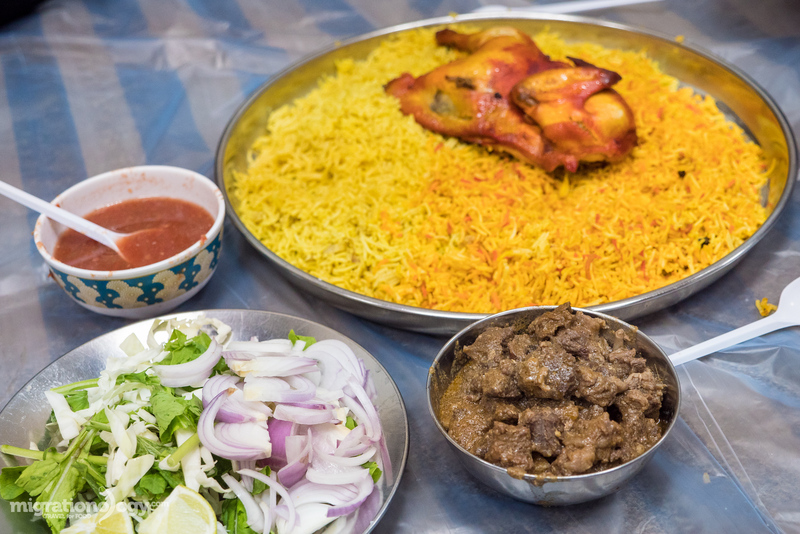 Also, this post from Eater about Omani food restaurants in Muscat has some good information. There are no shortage of things to do in Muscat, and what I really like is that Muscat is so calm and peaceful when I was there, you’ll never face any long lines or crowds. Here are a few of the top attractions I visited in Muscat. Sultan Qaboos Grand Mosque – Regarded as the main and most important mosque in Oman, the Grand Mosque is a magnificent place to see in Muscat. The outside marble and sandstone is beautiful, and the inside, with a giant hand woven Persian carpet and chandelier is impressive. Visiting the Grand Mosque is one of the highlights of any Muscat travel guide. Visiting Information: Address – Sultan Qaboos St, Muscat, Oman; Entrance price – Free; Open hours (for non-Muslims) – 8 am to 11 am on Saturday to Thursday (closed on Friday). 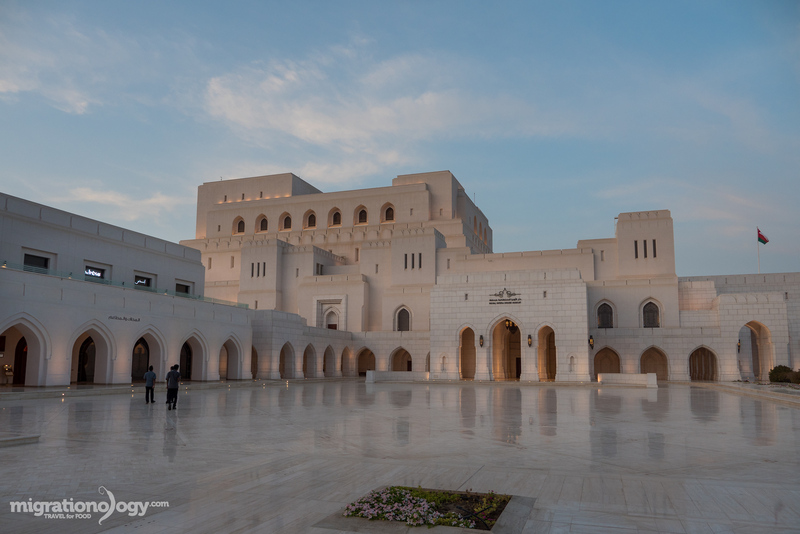 Royal Opera House Muscat – Another icon of art, culture, and architecture in Muscat is the stunningly beautiful Royal Opera House, completed in 2011. While you can purchase tickets to an opera or show if you’re in Muscat at the right time, you can also just admire it from the outside, or take a quick tour so you can see inside (that’s what I did). Visiting Information: Address – Royal Opera House, Al Kharjiyah St, Muscat 103; Entrance price – 2 OMR for tour; Open hours – 8:30 am to 2 pm daily. Bait Al Zubair Museum – One of the main Omani cultural museums in Muscat is the Bait Al Zubair Museum. I enjoyed the collections of firearms and Omani daggers and weapons. There’s also an outdoor traditional Omani housing display, and they also host events. Visiting Information: Address – Muscat 100, Oman; Entrance price – 2 OMR; Open hours – 9:30 am to 6 pm from Saturday to Thursday (closed on Friday). Muttrah Souq – The traditional Muttrah souq is an Omani bazaar in Muscat that is an important place of trade and culture. 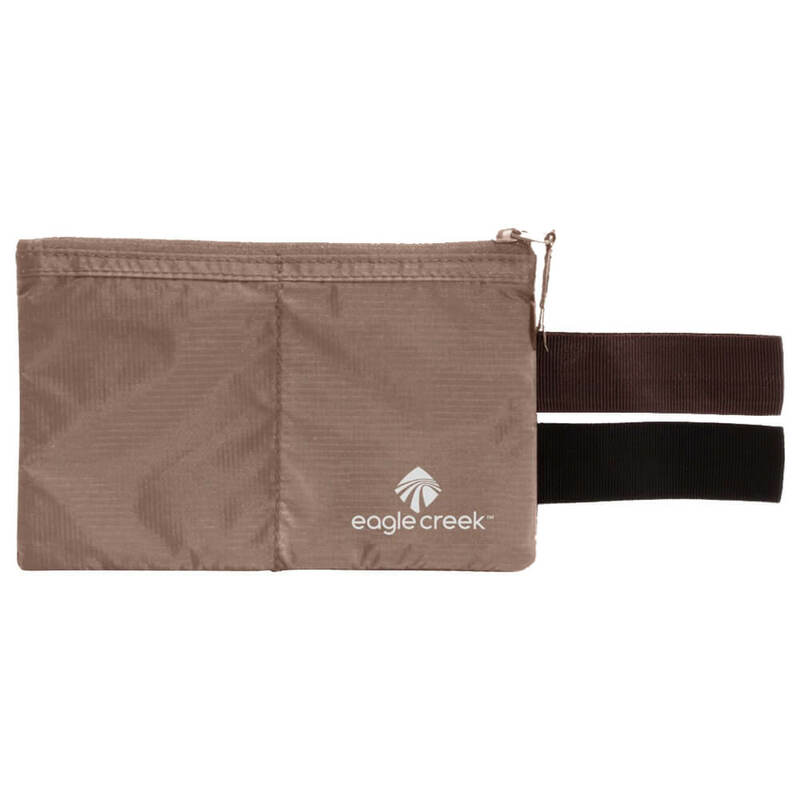 You’ll find everything from clothes and spices to gold and souvenirs. 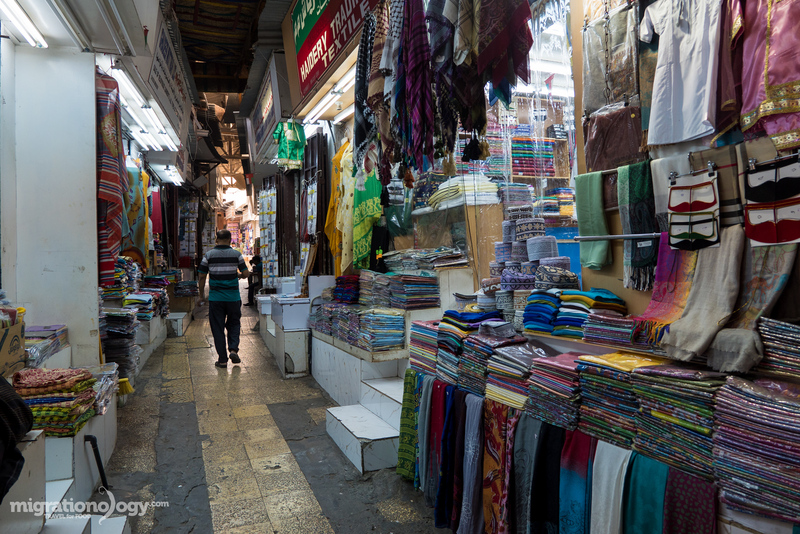 You can get lost exploring the fascinating back-lanes of the Muttrah Souq. Visiting Information: Address – Located at the Muttrah Corniche; Open hours – 8 am to 1 pm and 5 pm to 9 pm on Saturday to Thursday, and 5 pm – 9 pm on Fridays. Al Alam Royal Palace (Sultan’s Palace) – Oman is a Sultanate monarchy, ruled by Sultan Qaboos of Oman, and Al Alam Royal Palace is one of the official, ceremonial palaces in Muscat. You can’t go inside, but there’s a certain amazing feeling about just seeing it from the outside gate. Muscat Fish Market – One of my favorite things to do in any city I visit is go to the market or fish market, and Muscat has a small, but interesting fish market located in Muttrah. You’ll see the selection of freshly caught fish of the day, ranging from tuna to barracuda to giant sailfish. Visiting Information: Address – Located along the harbor in Muttrah; Open hours – 6 am to 10 am daily, I went about about 7:30 am. 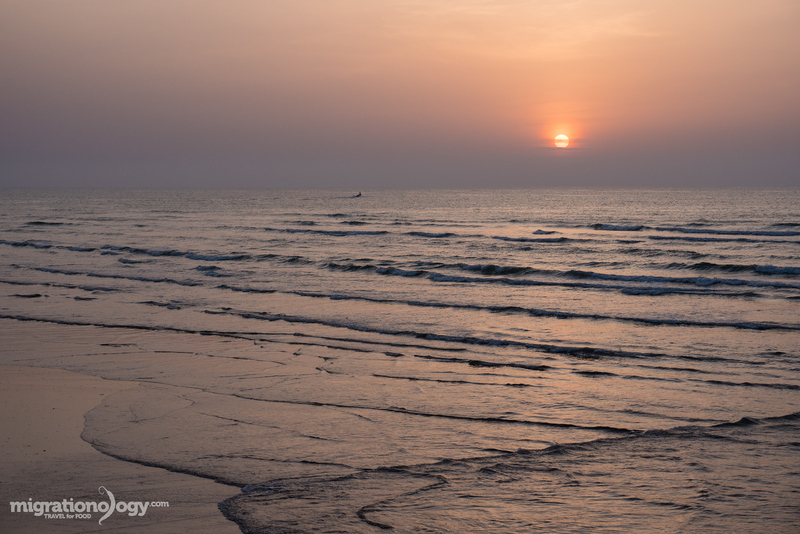 Qurum Beach / Qantab Beach – Finally in this Muscat travel guide I had to include some of Muscat’s beautiful beaches. 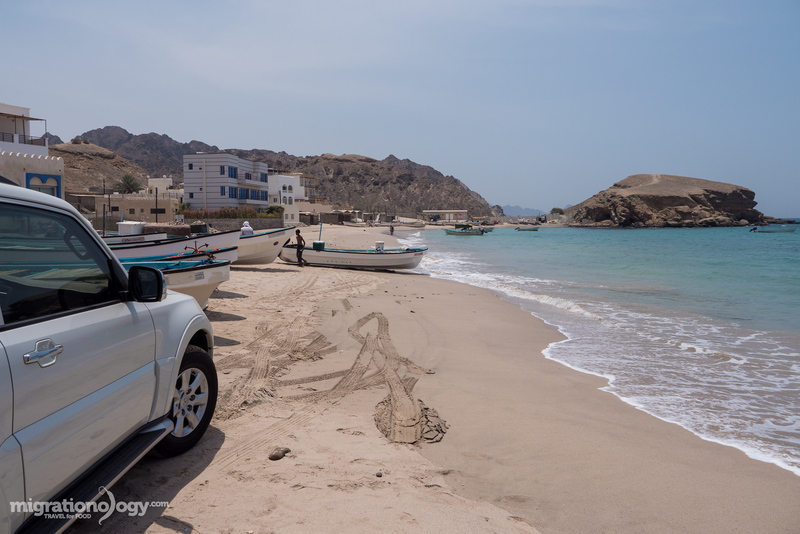 Qurum beach is right within Muscat, and you can walk along the beach, swim, or there are beach activities. But a little drive away, and home to some high end resorts is Qantab Beach, a beautiful series of coves of turquoise water beaches and rocky mountains. National Museum of Oman – Unfortunately when I was in Muscat, this museum was not yet open (it officially opened on 30 July 2016), but it’s now one of the biggest and most educational museums in Oman. The museum is over 14,000 square meters in size, and has a giant collection of over 12,500 things in its collection from around Oman and its empire. This Muscat travel guide is focused on Muscat, but if you do have some time to travel outside of Muscat, there are so many rewarding and beautiful places to see as well. We took a day trip to Nizwa, about an hour drive from Muscat and one of the cultural capitals of Oman. 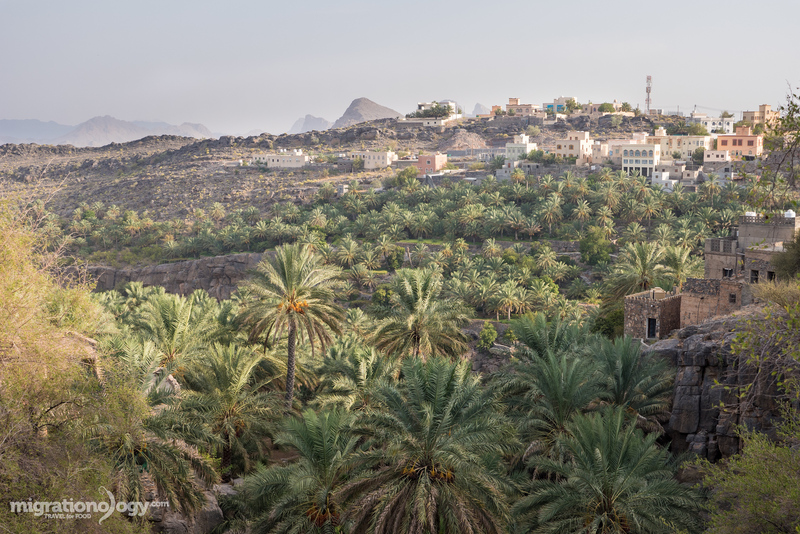 We then then continued on to visit Misfat Al Abriyeen, a date palm oasis and one of the highlights for me visiting Oman. There are also amazing wadis in the desert and beaches that you can visit if you have time when you’re in Muscat. Probably one of the most challenging things about visiting Oman is the transportation system. Public Transportation – In Muscat, there’s really very few options for public transportation at all (to my understanding they did just open a public bus route, but it’s extremely limited and unfrequent). And because Muscat is a city that’s so spread out, it’s virtually un-walkable. Sure you can walk around some areas, but you really need your own private car. Rent A Car – The cheapest option for getting around Muscat is to rent a car. And that way you do have the freedom and flexibility to go wherever you please. Driving in Muscat is quite straightforward as roads are extremely nice and spacious and signs are all translated into English. To rent a car in Muscat, you’ll spend anywhere from $40 – $100 per day (depending on type of vehicle), and many of the major car rental companies are available in Muscat like Avis and Hertz. Taxi – You could also take taxis around Muscat, but prices are quite high, and if you get anywhere outside the city, you might have trouble finding one. Here are the estimated taxi fares for Muscat, but this does not count for the airport taxis which are more expensive. I will just mention that when I visited Muscat, I had the benefit of a local friend with a vehicle, which made visiting attractions in Muscat extremely convenient. 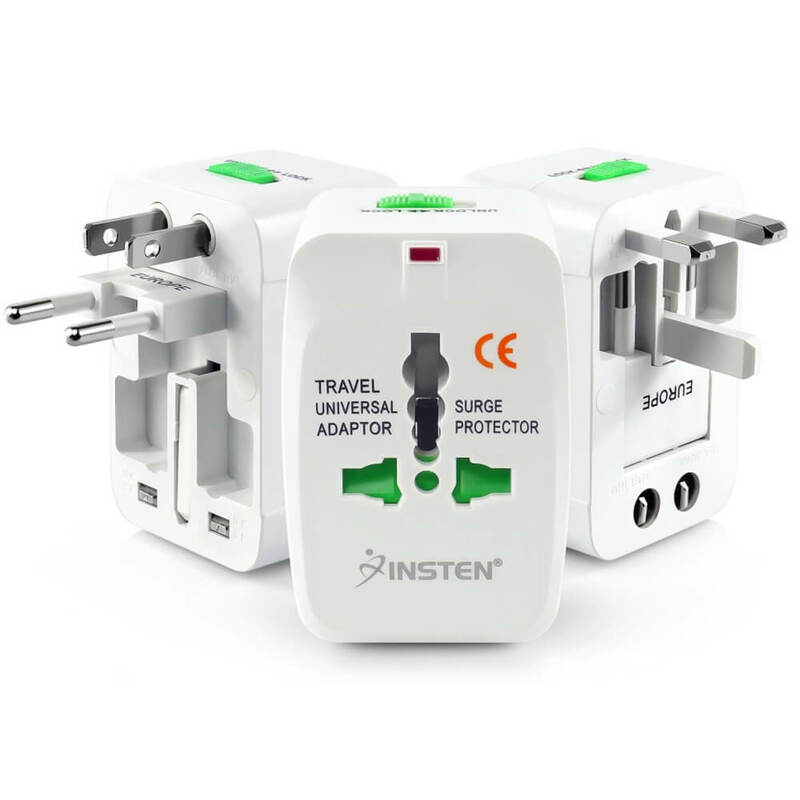 Here are just a few of the things I use when I travel (these are Amazon affiliate links). 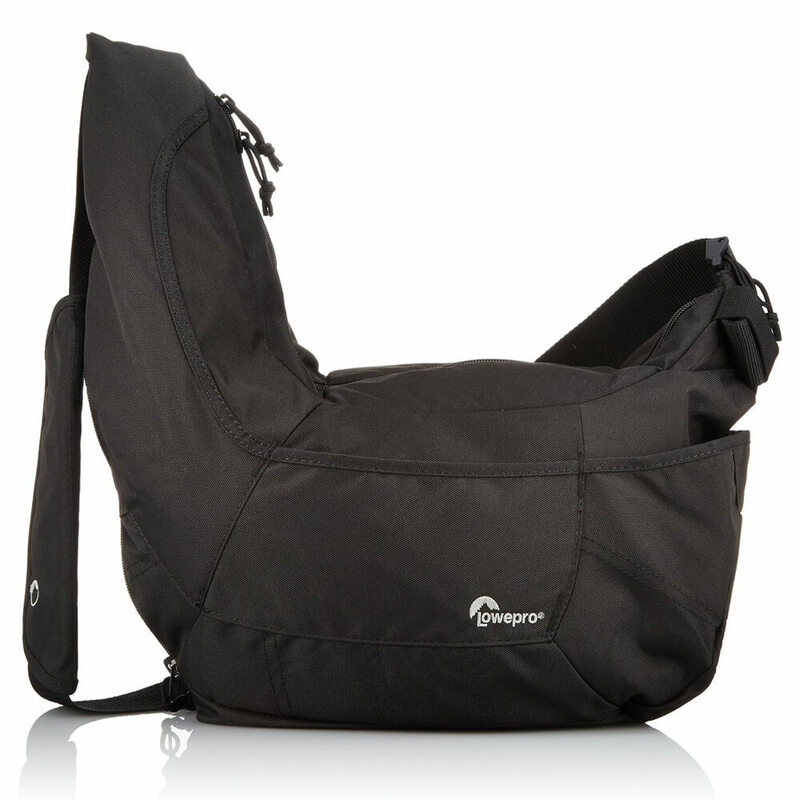 To see more of my travel gear, check out my full resources page. Oman is a relatively expensive destination to visit, although there are choices that can be made to travel on a budget as well. 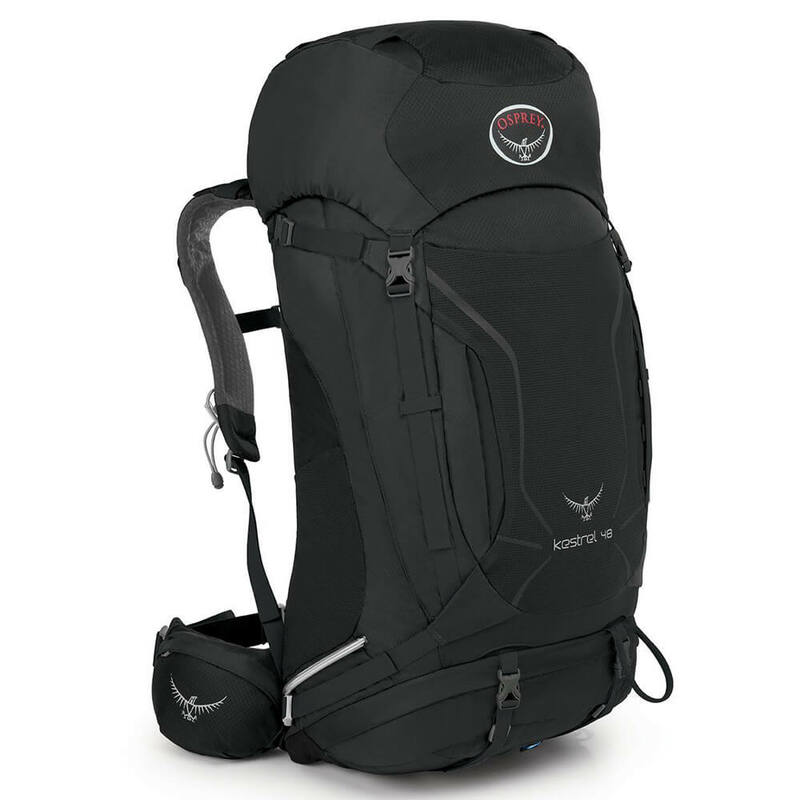 Accommodation and transportation from my experience are the big expenses when visiting Oman. In Oman the currency is Omani Rial (OMR) and it’s a very strong currency. At the time when I visited, the exchange rate was: 1 OMR = $2.60. NOTE: This is not an exact guide for money and expenses in Oman, but in this Muscat travel guide I just wanted to share some of the prices I paid to give you a general idea about how much it will cost you to visit, keeping in mind that you can always do things to save or spend more on any trip. On this trip, my wife and I were only in Muscat for two full days, but we made the most of our trip and did as much and ate as much as we could in the limited time we had. You can watch all the activities and food within this Muscat travel guide within the videos above, or watch my full playlist here on YouTube. Oman is an absolutely beautiful country – the people are extremely friendly and hospitable, the food and culture reflects the diversity of the history and trade, and the natural beauty of the rugged mountains, desert, and beaches add to the experience. I hope this Muscat travel guide for food lovers has given you some great ideas about the possibilities of what you can do and eat when you visit Muscat, Oman. Would you like to visit Oman? Leave me a comment! Check out all my city travel guides here.